Odzala-Kokoua National Park in the Republic of Congo is the premier rainforest reserve in west central Africa and harbours Africa’s highest density of western lowland gorilla. It is also the richest forest block in west central Africa for both primates and birds and plays host to significant numbers of large charismatic species such as Chimpanzee, Forest Elephant, Forest Buffalo, Lowland Bongo, Leopard and Spotted Hyaena. 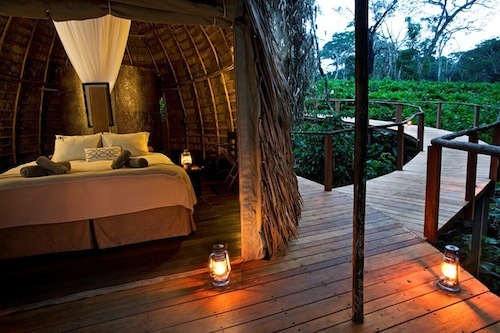 Wilderness Collection opened two camps – Lango and Ngaga – in the Odzala Wilderness Camps brand in mid-2012 as a means of using the high end ecotourism model to contribute to rainforest conservation both locally and globally. Firstly, by illustrating that rainforests and their wildlife have a value as intact ecosystems (through tourism employment, community revenue sharing and so on) and secondly, by exposing influential first world people to pristine rainforests in the developing world and explaining their significance. The success of the debut operating season during 2012, combined with lessons learnt then as well as during the current off season, has resulted in a reinvestment programme designed to improve the quality and environmental sustainability of the two camps, Lango and Ngaga. This additional capital investment will be undertaken in two phases which are outlined below. Upgrading of waste water treatment from septic tanks and soak-aways to sophisticated above-ground water treatment plants in order to avoid any potential impact on a very high natural water table. Improvement and expansion of solar array to ensure adequate energy generation. Replacement of all paraffin geysers with more efficient and effective gas geysers. Improvement of staff housing and facilities. Construction of raised wooden walkways between rooms and main area at Ngaga Camp. Construction of comfortable raised viewing hides at various bais in the concession areas.